The latest news headlines from professional associations and other groups involved in the steel industry. Since it was founded in 1959, the Latin American Iron and Steel Institute (Alacero) has always sought to promote the values of a regional integration in the industry to strengthen and defend interests and rights of steel manufacturing companies. Before 2011, Alacero was known as Ilafa (Instituto Latinoamericano del Fierro y el Acero). The American Institute for International Steel (AIIS) is the only steel-related trade association which supports free trade. The Institute accomplishes its mission through advocacy, networking, communications and education. Headquartered in Brussels, Belgium, the International Stainless Steel Forum (ISSF) is a non-profit research organization, which serves as the world forum on various aspects of the international stainless steel industry. ISSF was founded in 1996. AISI serves as the voice of the North American steel industry in the public policy arena and advances the case for steel in the marketplace as the preferred material of choice. AISI also plays a lead role in the development and application of new steels and steelmaking technology. AISI is comprised of 23 member companies, including integrated and electric furnace steelmakers, and approximately 125 associate members who are suppliers to or customers of the steel industry. AISI's member companies represent over three quarters of both U.S. and North American steel capacity. IREPAS is a global association of producers and exporters of long steel products. The Metals Service Center Institute (MSCI) is a trade association that supports and represents most elements of the metals value chain, including metals producers, distributors, and processors and, to a lesser extent, the interests of metals users. Its primary membership consists of metals service centers – businesses that inventory and distribute metals for industrial customers and perform first-stage processing. The Association for Iron & Steel Technology (AIST) is a non-profit organization with 16,000 members from more than 70 countries. With 29 Technology Committees and 22 Local Members Chapters, AIST represents an incomparable network of steel industry knowledge and expertise. Its mission is to advance the technical development, production, processing and application of iron and steel. Association of Women in the Metal Industries (AWMI) is an organization of professionals, founded in California in 1981, to promote and develop the growth of women in the metal industries. AWMI believes that women in similar industries can benefit themselves and their companies through relationships, education and shared knowledge. The South East Asia Iron and Steel Institute (SEAISI) is a technical institute; its main objective is to promote the iron and steel industry in the South East Asian region. It achieves its objectives by facilitating technology transfer from around the world, especially from Australia, Japan, Korea and Taiwan. The Specialty Steel Industry of North America (SSINA) is a voluntary trade association representing virtually all the producers of specialty steel in North America. Its members produce a variety of products including bar, rod, wire, angles, plate, sheet and strip, in stainless steel and other specialty steels. The Mexican Iron and Steel Industry Chamber (CANACERO)brings together Mexican manufacturers and processors of steel, and those closely associated with the industry. The Steel Manufacturers Association (SMA) consists of 34 North American steel producers who account for over 75% of domestic steelmaking capacity. SMA’s members represent a growing and dynamic segment of North America’s steel industry. Most are EAF steel producers, or mini-mills, who use a feedstock almost entirely composed of recycled steel scrap to make new steel. The Steel Market Development Institute (SMDI) is a business unit of the American Iron and Steel Institute (AISI). SMDI’s objective is to grow the markets for steel in the automotive, construction and container industries and for value-added long products, as well as in non-traditional steel markets such as energy. The SMDI also influences local, state and federal officials on the benefits of steel to ensure legislation that provides a level playing field for steel products and practices. The Steel Recycling Institute (SRI) is an industry association that promotes and sustains the recycling of all steel products. The SRI educates the solid waste industry, government, business and ultimately the consumer about the benefits of steel's continuous recycling cycle. EUROFER, the European Steel Association, is headquartered in Brussels, Belgium and was founded in 1976. It represents 100% of steel production in the European Union. The United Steelworkers union (USW) represents 850,000 workers in North America employed in many industries that include metals, rubber, chemicals, paper, oil refining and the service and public sectors. The World Steel Association (worldsteel) represents approximately 170 steel producers (including 17 of the world's 20 largest steel companies), national and regional steel industry associations, and steel research institutes. worldsteel members represent around 85% of world steel production. 28 Mar 2019 - With the digital tools that are available today, steel producers ought to move away from tons produced as a performance measure and focus instead on something more precise — profits per hour, said Noodle.ai chief executive officer Stephen Pratt. 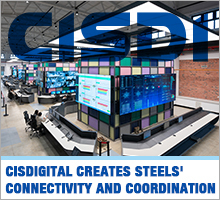 27 Mar 2019 - A bit of advice for steelmakers that are looking to deploy digital technologies but are unsure of where to start: begin at the end. What’s the Key Challenge for Planned EAF Mills? Timing. 15 Mar 2019 - The new EAF mills that are being built in the southern U.S. will need to confront a few challenges related to raw materials procurement and workforce recruitment, according the president of the Steel Manufacturers Association.